SFPEX is the original manufacturer of Force10 DWDM XFP GP-XFP-W45 - Force10 Networks DWDM 10 Gigabit Ethernet XFP optics module, LC connector (1541.35 nm, 100 GHz ITU grid, C-Band, Channel 45). We have ready stock for GP-XFP-W45 and can ship it out in two business days. 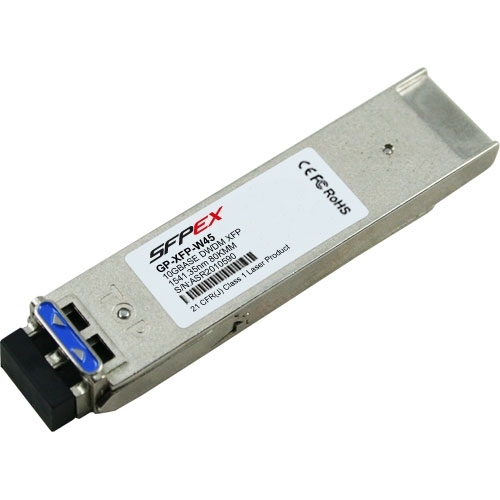 We guarantee the GP-XFP-W45 transceiver module to work in your system and all of our GP-XFP-W45 transceiver modules come with a lifetime warranty. The GP-XFP-W45 is a Class 1 laser product. It fully complies with the multi-sourcing agreement (MSA) which enables it to work in all MSA compliant platforms. The GP-XFP-W45 must be operatred within the specified temperature and voltage limits. The optical ports of the module shall be terminated with an optical connector or with a dust plug.